Huntsman: up until the end of the 2017 – 2018 season Nigel Peel hunted the hounds for the NCH. West Midlands Hunt Saboteurs have also kept an eye on them over the seasons, as have the independent Hunt Monitors on occasion. In 2014 footage was filmed which showed people connected to the hunt feeding foxes in an area which they hunt in – the vehicle was traced to the hunt kennels. This was covered by a number of media outlets at the time. Following this, “West Midlands sabs decided to pay them a visit. After ensuring one fox escaped the hunt safely, the sabs found the Huntsman (Nigel Peel) with the hounds in full cry in the same field that featured in the ITN report. A combination of foot sabs in the field and sabs back in the van ensured the 2nd fox also got away. A third fox then ran past the sabs who stayed in the area until it was safe to leave“. Please check out West Midlands Sabs for more on the great work they have done and continue to do! 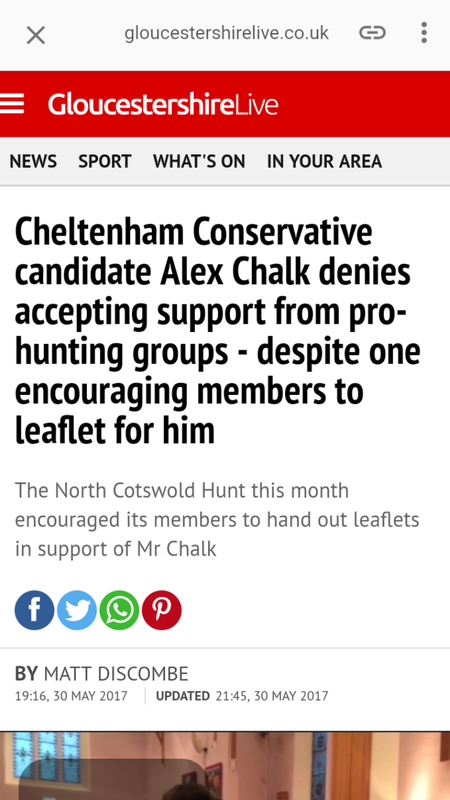 This doesn’t come as a massive surprise and their behaviour had still not changed a couple of seasons later when whistles and holloas were used at this meet to indicate that a fox had run from the covert the hunt were in. Supporters then pointed to show where the fox had run (even Calvin Crossman, the guy with the eagle, who is there to pretend that it’s all about falconry…). Luckily scenting conditions weren’t good at that time of day, so the scent was lost of that particular fox. Videos were shot throughout the day of the hunt barging on to various roads, more holloas and whistles, more pointing, lots of dodgy terrierman activity and the blocking of roads… This video mainly stars the man driving the flesh wagon (also seen at the VWH and Cotswold hunts…) which blocked the same road twice, called a sab a ‘slag’ and then swerved at the sab vehicle when it was parked in a layby on a bend of the road. Nice guy! Moving on later in 2016 and September saw the breaking of a camera, assault of a sab and the breaking of her glasses at a cubhunting meet… all to try to distract from what the hunt and their terriermen were up to nearby. 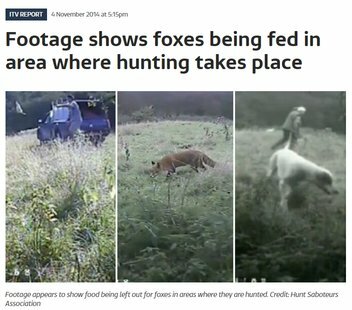 Around a month later, on October 24th during a cubhunting meet near to Evesham, hunt hounds ran a fox to ground. Sabs caught terriermen at an active badger sett that they had begun to dig into to get to the fox, entrances to the sett freshly blocked up. Terriermen then abandoned the terrier who had been put into the sett for 2hrs, facing off with the hunted fox and potentially the resident badgers. With no hunt staff in sight when she emerged from the sett, she was taken by sabs to a vet with a suspected bite to the neck with sabs subsequently accused of theft. 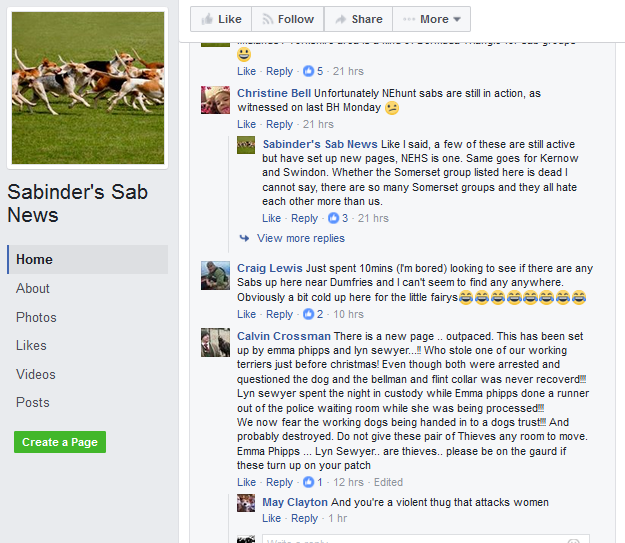 Ironically due to this allegation and arrests of sabs which followed those looking after the terrier responded by moving the terrier to a safe house and even sabs concerned no longer know her location, only that she is safe. A vet report confirms that she had been repeatedly used for breeding, that she must have lived mainly on concrete, that an old dislocation of a hip had never been set to heal properly and many of her back teeth had been violently broken. Additionally she is roughly only 5yrs old, although she looks much older. 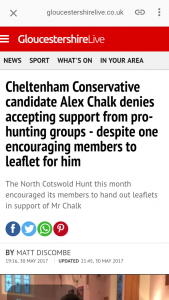 Following this incident, the next time we caught up with the hunt was on December 28th that year when hunt staff took it upon themselves to punish sabs. The three unmasked, female sabs present at the meet were driven at, sworn at and had threats of sexual violence made towards them as well as one sab being punched in the face, having her head slammed into the frozen ground and being kicked in the groin by hunt members who were attempting to stop them finding artificial earths which the hunt were acting suspiciously around. 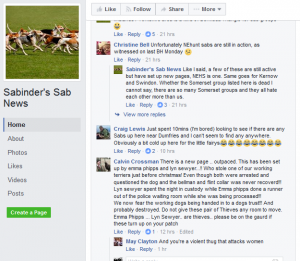 While the ‘theft of dog’ case against the sabs has been dropped due to there being no evidence that they stole the terrier, investigations continued into the revenge attacks against the sabs in December.